Longtime raquet enthusiast Fredi Brodmann has turned his passion for Ping Pong into a new portable paddle ball game the whole family can enjoy. No big bulky table required. 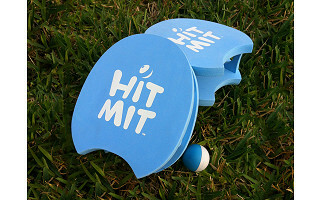 Hit Mit is a set of one-size-fits all paddle that you wear on your hand like a glove. Without a handle to get a grip on, hitting becomes as easy as giving the ball a high five. The unique construction is designed for better response time and ball placement. Anybody can get the hang of it, kids and adults alike. Made of EVA foam, the soft, lightweight, waterproof paddles and ball come in a convenient storage bag perfect for a day at the beach, a pool party, or a backyard barbeque. Our testers even played it indoors. 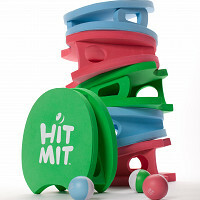 Hit Mit just may become the exception to your no playing ball in the house rule. Since that unexpected moment at the beach where velcro ball was transformed into Brodmann Blades, and then into the Hit Mit, it was clear that ideas happen and take on a life of their own. The ball is no longer stuck to the paddle and with the Hit Mit you are no longer stuck to the table. It sets your game free. Reinventing the wheel? No - just reinterpreting the ball game, adding a new option to challenge your motor skills, response ability, physical and mental flexibility, routine. Try a new angle, get away from the computer for a minute, stay curious and open minded. Welcome Grommeteers. I'm here to answer all your questions throughout the day. This looks like great fun! Can you use a ping pong or other ball with the paddles? Each set you purchase comes with 2 paddles, 3 balls and a mesh bag. You can however use other balls if you'd like, they should just be small enough to fit on the paddle. Longtime raquet enthusiast Fredi Brodmann has turned his passion for Ping Pong into a new portable paddle ball game the whole family can enjoy. No big bulky table required. 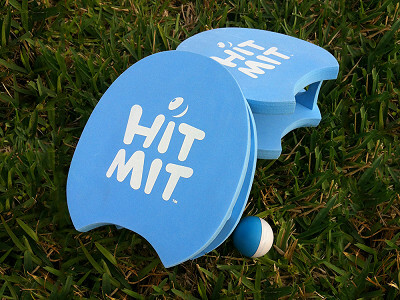 Hit Mit is a set of one-size-fits all paddle that you wear on your hand like a glove. Without a handle to get a grip on, hitting becomes as easy as giving the ball a high five. The unique construction is designed for better response time and ball placement. Anybody can get the hang of it, kids and adults alike.